Terence Casey says the “plague” of suicides in Kerry has reduced since the late teenager appealed to young people not to take their own lives. 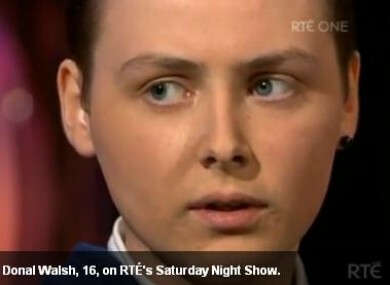 Donal Walsh on RTE's Saturday Night Show. KERRY CORONER TERENCE Casey says that Donal Walsh’s appeal to young people about suicide has “considerably reduced” suicides in Kerry. Speaking to TheJournal.ie, Casey said “Donal speaking out in the way he did has made a huge difference. I usually deal with 18 suicides a year, about 1 and a half a month on average. But since Donal spoke out against suicide, I have had no suicides from March to August”. Casey said that it was a “great change” and one he said he hoped would continue. Teenager Donal Walsh, who died from terminal cancer in May of this year, inspired many when he wrote an article on the issue of teen suicide. He went on RTE’s The Saturday Night Show and called on teens not to take their own lives. What Donal did has had a great affect on the suicide rates in Kerry, it really has had a massive affect. I think him being able to speak to his peers in the way he did has made a difference. The figures look very good. The National Office for Suicide Prevention released it annual report recently, where it stated that over three year intervals, Kerry had seen an upward trend in suicides since 2004. The report gives the rate of suicide deaths per 100,000 population across the country. It shows that Kerry had an average of 11.3 from 2004-2006, which rose to 15.5 from 2008-2010. Speaking about the report, Casey said that while it was good to investigate the numbers, he said the report was outdated. “That report only goes up until 2010. Both 2010 and 2011 were bad years, 2012 got a bit better and now in 2013 I am seeing a turnaround”. I started speaking about it a few years ago and over the last few years there have been a lot of campaigns and awareness about the subject. I think it is important that more people speak out about it and their experiences. I commend Donal’s parents for raising such a great lad, who was strong enough to speak about suicide and make a difference. In memory of Donal, his family recently set up the Donal Walsh #Livelife Foundation. Samaritans is available for anyone in any type of distress. You can call them on 1850 60 90 90 in the Republic of Ireland or 08457 90 90 90 in Northern Ireland or by email at jo@samaritans.org. Email “Suicides in Kerry decreased since Donal Walsh spoke out, says coroner”. Feedback on “Suicides in Kerry decreased since Donal Walsh spoke out, says coroner”.